Last month at the annual NFPA meeting in Boston, NFPA 70E passed one of the final milestones on the road to completion and it is expected to be issued later this summer. The 2018 edition of NFPA 70E will include several updates, including changes to the tables, job safety planning, the hierarchy of risk controls, conformity assessment of PPE, and Risk Assessments. This blog will focus on the changes to the tables. It all started when tables titled Hazard Risk Category (HRC) Classifications were introduced in the 2000 edition of NFPA 70E. They listed common work tasks broken down into six HRC Numbers ranging from -1 to 4. Since their introduction, the tables have evolved with each subsequent edition and have sometimes been the source of controversy. The 2004, 2009, and 2012 editions of the standard edited content and eliminated the two lowest of the six HRCs, leaving the familiar HRC levels 1, 2, 3, and 4. In the 2015 edition, the tables were re-engineered to simplify their use and align them with the risk assessment process. 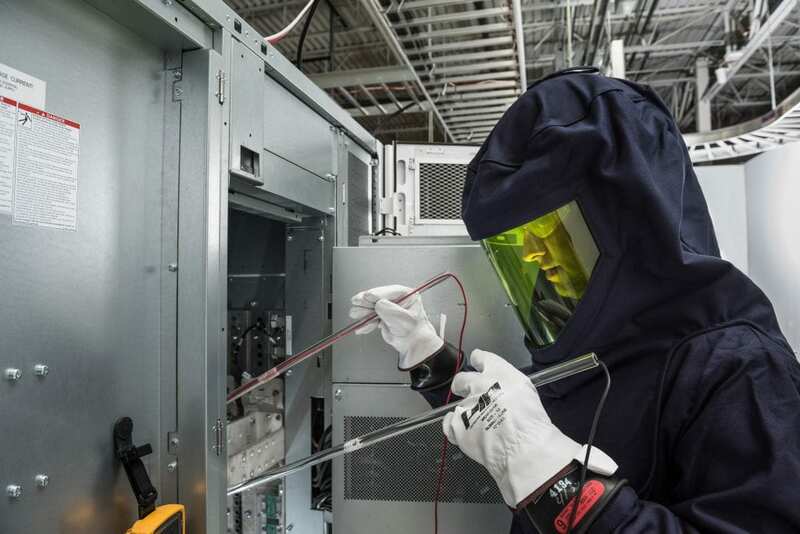 The HRCs were renamed to Arc Flash Hazard PPE Categories, but thankfully kept the four arc rating classifications of 4, 8, 25, and 40 calories/cm2. Most table users will be glad to know that the same general approach they have been using will continue in 2018. Workers will first find Table 130.5(C) where he/she can estimate the likelihood of occurrence of an arc flash incident based on task and equipment condition. For those situations with a significant likelihood of occurrence, PPE categories are then determined by going to either Table 130.7(C)(15)(a) or (b). These tables, one for AC and one for DC, identify various types of equipment and circuit parameters and indicate the associated arc flash PPE category. As in the past, if the equipment and circuit do not fit all the parameters, a PPE category cannot be determined from the tables and an incident energy analysis is required. You may be thinking that all sounds familiar, what is changing? The audience is changing! In the 2015 edition, you cannot use the tables if you performed an incident energy analysis on the equipment. However, the guidance in the new Table 130.5(C) will be permitted for use by both those individuals who used the tables method and those who have performed an incident energy analysis. The new guidance is broken into two simple levels of exposure, 1.2-12 cal/cm2 and greater than 12 cal/cm2. Of course, the PPE ratings must meet or exceed the level of the hazards, but Table 130.5(G) identifies a simple, two-category method for selection of arc-rated clothing and other PPE. With the release of the 2018 edition of NFPA 70E, everyone can benefit from the tables. Guidance will be consistent and easy to follow when estimating the likelihood of an event as well as selecting the appropriate protective clothing and PPE. To stay updated on NFPA 70E and other code changes, make sure to join our Electrical Contractor Portal, with free educational resources. Great to hear about the heads up on the change being made to table 130.5(C) which allows us to use the table when an incident accident analysis has been performed. Not being able to always causes unnecessary confusion and delays with our safety officers, foreman, superintendents, supervisors, and the Government’s safety officers. Looks like they’ve heard enough complaints in the industry and have listened! Looking forward to this change! If ONLY 2018 70E tables used in the absence of a short-circuit study and coordination study, what level of protection can really be expected? While an incident energy analysis is more precise, there are many locations where the PPE Tables are used to protect workers. In most cases if Table 130.5(C) is used to estimate the likelihood of occurrence, Table 130.7(C)(15)(a) or (b) is used to determine the Arc Flash PPE Category and Table 130.7(C)(15)(c) is used to select PPE, the protection level will be appropriate. It is important to note that ALL noted circuit parameters must be met to properly use the tables. If ANY of the parameters do not meet the criteria, the Tables cannot be used to determine a PPE category and an incident energy analysis is required. Since the 70E tables are based on both calculations and experience, a few isolated inconsistencies may exist for certain combinations of circuit parameters; however, I am not aware of any evidence presented to the 70E committee demonstrating that these have resulted in real world incidents.